This listing is for the pictured Airbag Rotary Coupling removed from a 2001 Audi A2. Please make sure the part number is correct for your vehicle before buying. The airbag is in good used condition and comes with a 90 day guarantee. If you are unsure about fitment to your vehicle please send a Message / Enquiry. REMOVED FROM AUDI A2 2003 1.4 PETROL 5 SPEED MANUAL. Part Number 8E0880201L. AUDI A2 A3 A4 A6 STEERING WHEEL AIRBAG. Part: New Passenger Side Front Seat Airbag. We will do our best to resolve any problems you may have. Part Number:8z0880241. All our parts are security marked before being dispatched. IV, HS, KA27-28, KW, PA, PH, ZE, BT, TR and PO. PART NUMBER - 8Z0959655E. AUDI A2 1.4 PETROL 2001 MODEL 5 DOOR. AIR BAG MODULE. O.G.B (BAY 6). INTERIOR CODE - N0G/YB. PICTURE OF THE CAR IS FOR ILLUSTRATION ONLY. PAINT CODE - LY9B. PART NUMBER: 8E0880201AA. WE HELP YOU FOR A HASSLE-FREE, SIMPLE AND EFFICIENT WAY TO HANDLE ANY ISSUES. REMOVED FROM AUDI A2. AIRBAG AS SHOWN IN PICTURE. You must be 100% sure that the details supplied in the advert match. MOST OF THE PARTS ARE AVAILABLE FOR THIS VEHICLE. AUDI A2 2000-2005. We cannot be held responsible if the item does not fit your vehicle. 2001 AUDI A2 1.4 TDI. DASHBOARD AIRBAG KIT. BARE DASHBOARD PANEL WITH PASSENGER AIRBAG. FITTED TO A 2001 AUDI A2 WITH A 1.4 DIESEL ENGINE WITH A 5 SPEED MANUAL GEARBOX. AIRBAG MODULE. 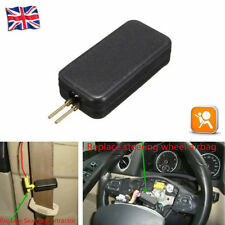 AIRBAG KIT COMPRISES OF. Part Numbers: 8Z0959655E. 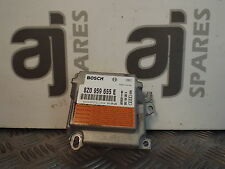 BOSCH PART NO: 0285001385. Make: AUDI Model: A2 SE. WARRANTY: All used parts are fully tested and working before removal from the donor vehicle. PART NUMBER 8Z0880241. ALL PARTS ARE USED & FULLY TESTED UNLESS OTHERWISE STATED. BEARING IN MIND THE AGE OF THE VEHICLE. IF THERE ARE PART NUMBERS IN THE ADVERT, THEY'RE THERE FOR A REASON. THIS MUST BE CHECKED PHYSICALLY AGAINST THE PART YOU ARE REPLACING. Make: AUDI Model: A2 SE. WARRANTY: All used parts are fully tested and working before removal from the donor vehicle. Part Numbers: 8Z0959655E. PART NUMBER 8E0880201L. FOR RIGHT HAND DRIVE VEHICLES. IF THERE ARE PART NUMBERS IN THE ADVERT, THEY'RE THERE FOR A REASON. THIS MUST BE CHECKED PHYSICALLY AGAINST THE PART YOU ARE REPLACING. IF IT DOESN'T MATCH THEN IT IS MORE THAN LIKELY WILL NOT WORK ON YOUR CAR. PART NUMBER 8Z0880204B. IF THERE ARE PART NUMBERS IN THE ADVERT, THEY'RE THERE FOR A REASON. THIS MUST BE CHECKED PHYSICALLY AGAINST THE PART YOU ARE REPLACING. IF IT DOESN'T MATCH THEN IT IS MORE THAN LIKELY WILL NOT WORK ON YOUR CAR. ALL PARTS ARE USED & FULLY TESTED UNLESS OTHERWISE STATED. BEARING IN MIND THE AGE OF THE VEHICLE. IF THERE ARE PART NUMBERS IN THE ADVERT, THEY'RE THERE FOR A REASON. THIS MUST BE CHECKED PHYSICALLY AGAINST THE PART YOU ARE REPLACING. AUDI A2 2001-2005. ECU will need decoding! Removed from a RIGHT-HAND DRIVE vehicle. German Spare parts Ltd. German Spare Parts Ltd. (The part number can be found on the part you're replacing). PART NUMBER. PART NO - 8P0 880 201BL. AUDI A2 AIRBAG. WILL FIT AUDI A2 2000 - 2005. VW / Audi / Skoda / Seat Used Spare Parts Specialist. Parts have been fully tested and include a 3 MONTH WARRANTY. We will always help you to have a 100% positive happy buying experience. In the event that a part is supplied and proven to be incorrect or faulty, Bits & Parts Ltd. must be notified within 48 hours. Audi A4 B6 Airbag Crash Impact Sensor 8E0959643A. Condition is Used. Dispatched with Royal Mail 2nd Class. (Taken from : 2001 AUDI A2 1.4 PETROL AUA, SILVER LY7W, 5 SPEED FCU, 5DOOR). Used Condition! Have minor mark, slights scratch. YOU WILL FIND MORE INFORMATION ABOVE. Right, pretensor: 8z1857706 belt sec. left, pre-tensioned: 8z1857705. Tipo de recambio Kit de airbag. Color Blanca. Portugal: Is voce needs to know is this Freckle valid e o seu vehicle, você pode send us or VIN number do seu vehicle. (Taken from: 2001 AUDI A2 1.4 PETROL AUA, BLUE LZ5R, 5 SPEED FDM, 5DOOR). Used Condition! Have minor mark, slights scratch. YOU WILL FIND MORE INFORMATION ABOVE. All parts are used, fully tested and are in fully working order, unless stated in the title. AUDI A2 AIRBAG. WILL FIT AUDI A2 2000 - 2005. Left Dash Airbag - Part Number 8Z0880204B. This part was removed from a Right Hand Drive Vehicle. Compatibility is a guide only. Your item will need to be signed for. Other Details. TRIM LEVEL. Part Number. (Taken from : 2001 AUDI A2 1.4 PETROL AUA, SILVER LY7W, 5 SPEED FCU, 5DOOR). YOU WILL FIND MORE INFORMATION ABOVE. Used Condition! Have minor mark, slights scratch. • These Simulator can be used to simulate • These simulators are for diagnostic/troubleshooting purposes only. 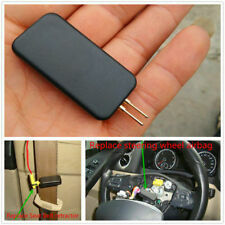 They will make the airbag computer think that the airbag or seat belt pretensioner is connected and, if no other problems exist, should make the airbag light go off. (Taken from : 2001 AUDI A2 1.4 PETROL AUA, SILVER LY7W, 5 SPEED FCU, 5DOOR). YOU WILL FIND MORE INFORMATION ABOVE. All parts are used, fully tested and are in fully working order, unless stated in the title. Donor Car: 2002 Audi A2 1600cc Sport. The New and Used Audi Parts Specialist for all Audi models worldwide. It may fit others. Audi Part Number: 8Z0 959 655 E.
REMOVED FROM A 2002 AUDI A2 IN GOID USED WORKING ORDER. A2 2000 - 2005 . 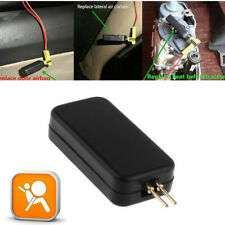 This is a impact / crash sensor for the following cars This is a new,genuine Audi part. Part number. Alternative part numbers. P/N 8Z0880204B. AUDI A2 1.4 LITRE DIESEL (TD) 2003 MODEL. PASSENGER SIDE AIRBAG. AJ SPARES LTD. PAINT CODE - GREY. GEARBOX CODE - EWQ. ENGINE CODE - AMF. AUDI A2 1.4 LITRE DIESEL (TD) 2003 MODEL. PAINT CODE - GREY. P/N 8E0880201AA. DRIVERS AIRBAG. GEARBOX CODE - EWQ. ENGINE CODE - AMF. 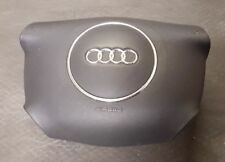 AUDI A2 DIRVER SEAT AIRBAG. ITEM IS USED DOES HAVE SIGN OF USAGE BUT IN FULL WORKING ORDER. PART NO - 8Z0880242. 1J0 959 654AC. 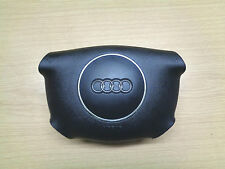 2003 AUDI A2 1.6 FSI Sport 5dr STEERING WHEEL AIRBAG SQUIB. USED PART WORKING FINE HAS SIGNS OF WEAR.